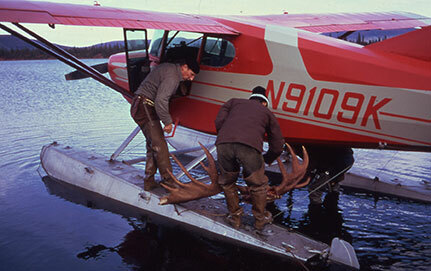 Many Alaska hunters use fly-in services for hunting, and its important to plan for the strengths and limitations of aircraft. For example, duffel bags are good, suitcases and coolers are bad. Thousands of hunters take advantage of unguided fly-in hunts every year. Hiring an air taxi to fly out and drop you off can be the experience of a lifetime, or it can be a nightmare. The more you know, the better your hunt will be. Your first call to us is usually, "Where can I get a moose (or sheep or caribou or bear or whatever)?" Our answer will always be, "It depends." Yes, we do try to keep an eye on likely areas where we can put our customers, but in many cases we can't fine-tune things until just before the season. We will try to drop you where you'll have a good chance to get what you're after. We won't put you on top of any of our other clients hunting for the same species. Of course, we can't guarantee there won't be other hunters there, but there won't be anybody there who flew in with us. And if we know a location is going to be crowded, we'll try to avoid it. Likewise, we can't guarantee a trophy hunt, and any air taxi operator who does should be taken with a large grain of salt. Accessible areas can be reached by anyone else with a plane (and undoubtedly have been for years), and trophies are few and far between even though the overall hunting may be good. In any case, don't expect us to try to stick a Cessna 185 into a 400-foot Super Cub strip on the side of a mountain, even if there's a 70-inch bull munching shrubs at the end of the runway. If you want a trophy, go with a licensed guide, and be prepared to pay handsomely for the privilege. This leads to the next question, price. Hunting rates may be different from normal charter rates simply because hunters often involve more work than other customers, and may involve additional trips. Most air taxis offer the whole airplane for a fixed hourly rate. This includes the entire flying time for the pilot and airplane, even when you're not on it, multiplied by as many trips as are necessary to get everything safely out and back. For many locations we have a price already listed, but it's still based on flying time. Some operators may offer flat rates or per-person rates. Check these out carefully - you may be going with someone else and you may end up someplace you're not thrilled about. When you plan your departure, allow leeway for weather. 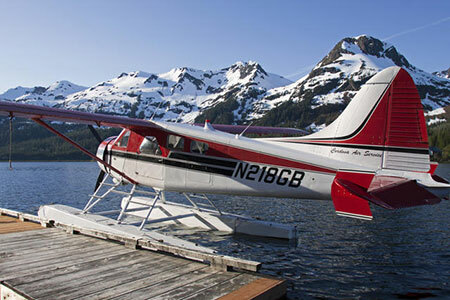 Alaska is notorious for foul weather during hunting season, and almost no air taxi aircraft are certified for instrument capability. Besides, the drop-off location probably doesn't even have so much as a windsock for an instrument approach anyway. Usually a three-day window, or an alternate date several days later, will do nicely. Establishing the pick-up is critical. We will do our best to be where you say you will be, when you say you will be there. Don't worry if we're not there exactly on time. We may be delayed by weather or other factors beyond our control, but we'll be trying to get there. In the worst case, remember that any reputable air taxi will make sure someone else knows you're there. And of course you will have notified someone to check with us if you're not back on time. 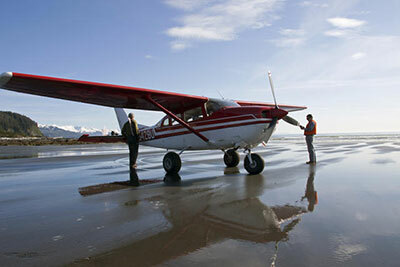 Wheel planes can access remote landing strips and can land on beaches and river bars, depending on the conditions. Ken Marsh photo. In some cases we may be early. Sometimes we can fly by and check on you while you're in the field. The universal signal for an early pickup is to spread a tarp out in a prominent place. We can also be early if we know the weather is going to get really bad and there's a risk you'd be in the field too long. Late in the season, we will also want to get you out before the first big snowfall. It's nice if you have some way to communicate from the field, but it's not required. We sometimes have no way of knowing what the weather is like at your camp, and any information will help us. We can also let you know if we're having problems. Cell phones work in many areas, and the new satellite phones are usually effective. You can rent satellite phones at a reasonable rate. An aircraft radio is sometimes useful for short-range work, and a simple handheld CB can be a lifesaver. What should you take in with you? We see a staggering range of loads going out to the field. Some people take everything, while others take so little we worry they'll have enough. The rule of thumb is to pack as lightly as you possibly can, especially if you're going to have to pack it someplace after you get off the plane. But remember that the weather during hunting season can quickly turn lousy and can stay that way for days. Don't leave yourself short. There are some things you should NOT take. It is absolutely against the law to carry bulk propane bottles with passengers. The only acceptable propane is in the small disposable cylinders. (On a float plane, small bulk propane bottles MAY be carried externally or in the floats.) You can take gasoline or Coleman fuel inside the cabin, though - up to 20 gallons per load. Under NO circumstances can you carry any kind of incapacitating agent inside the airplane, such as bear spray. It doesn't matter if it's hermetically sealed in a fireproof safe - it can't go in the cabin. However, these MAY be carried externally, even on wheel planes, by taping the canisters to the strut or gear leg. Guns must be unloaded to go in the plane. The ammunition must be separate from the gun, not in the case. Don't wear your pistol in the plane, loaded or not. You can fly your guns in hard cases if you want, but it's a lot of extra weight and bulk. Soft cases generally do fine and are a lot less trouble. Any air taxi will be glad to hold your hard cases until you get back. Big bulky items are a headache. Large coolers are bad. Small coolers are better if you need them. In general, anything big and bulky that won't stuff or fold is going to be a problem. Things longer than 6 or 7 feet can also be awkward. Small items we can massage to fit odd spaces are always better, and you'll get more loads for your money. If you have to take something big, please talk it over with us before you surprise us on the ramp. A Beaver on floats is fairly roomy aircraft, compared to the also popular Cessnas. Ken Marsh photo. We expect you to get all your permits and licenses and tags and harvest tickets. Most air taxis don't sell these. We usually take you at your word when you say you're legal to go to a specific game management unit. Some of our locations may require permits from Native corporations or other landholders. If we think one of these areas may be good for you, we'll let you know ahead of time and you can decide if it's what you want. When it's time to come home, remember that the load capability coming out may not be as heavy as that going in - sometimes much less. When possible, we try to limit the outbound load to whatever we can get out of the remote location in one load, unless you agree that two or more return loads will be needed. If you get a moose, you can definitely count on paying for an extra load, but we can often fit in a sheep or caribou (or even a couple) without an extra flight. PLEASE trust your pilot's judgment when he says enough is enough. Remember that most pilots are hunters, too. We have a pretty good idea how much meat should be coming out from a moose or caribou (boned or otherwise), or if something isn't quite kosher. If we do find out you're not playing by the rules, we will notify Fish and Wildlife Protection. When we bring out your animal, we will check for tags and tickets and, if necessary, a transfer of possession form. And don't forget that the rack can't come out until the meat is moved. A note on racks: With a Cessna or a Beaver on wheels, ALL racks must go inside the airplane. Big caribou racks are notoriously difficult to fit inside Cessna cabins and may require an extra flight because of the space they take. Super Cubs or aircraft on floats may be able to carry racks outside. However, external loads can be very tricky and can significantly cut into the total load. Lots of people ask us if we can fly around the area so they can see what's there. We will normally try to give you as much extra look-see time as we can, but if it's more than five or ten minutes we'll probably charge you for it. We'll be happy to set up a separate scouting trip ahead of time if you like, or we can plan to add extra time to your trip out. Nothing makes us happier than to land you within shouting distance of a legal animal - but please don't abuse your advantage and hunt on the same day that we fly you in. An unguided fly-in trip is arguably the cheapest way to get into some superior hunting if you don't have your own airplane (or a friend with one). The average air taxi operator will bend over backward to help you out. But it's a two-way street, and the more you help yourself, the more we can help you. This article first ran in Alaska Wildlife News in 2004. Don Bowers was a longtime Alaska pilot who died in 2000.